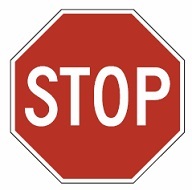 36-inch R1-1 STOP sign. Available in three levels of reflectivity: Engineer Grade Prismatic (Standard Reflective), High Intensity Prismatic or Diamond Grade on .080 gauge aluminum. Used at intersections where a full stop is required at all times. Sign normally used by cities and towns is 30-inch High Intensity Prismatic. Bottom of sign should be 7 foot above ground (at least two feet from edge of road) in urban areas, and 5 feet from ground (at least 12-foot from road edge) in rural areas. This size is normally used in high-speed areas, such as interstate on- and off-ramps.